Mayline commute chairs are the hottest thing to hit the office seating world since panel furniture! This line of incredibly cool office chairs is selling like hotcakes and for good reason. Mayline Commute chairs offer style and quality ergonomic features that are sure to keep you comfortable all day. And as with most Mayline seating, Commute chairs offer an affordable price tag that even the tightest budgets can appreciate. In Today's post we will do a quick overview of our favorite Mayline Commute Chair! 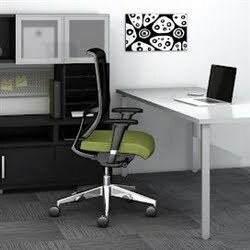 The C1CB Commute series chair features an attractive polished frame that really stands out. However, if we look further, several other details begin to reveal themselves. As a simple to spec solution for today's office environment. The Mayline Commute chair fits users from small to tall by leveraging the seat slider. The new Commute chair is available in both mesh back and upholstered back styles and with a variety of additional ergonomic features. This modern swivel chair is revolutionizing the seating industry. Synchro-tilt mechanism and 2 1/4" travel seat slider, tilt tension, and tilt lock.